Plain Jane (and no nonsense): Why? Why would anyone - man or woman - having occasion to wear a polo shirt go to the trouble of making its collar stand up? It was the 80s, wasn't it, when we last thought this was cool? But even then it applied to the crisp shirt, not to this horrible garment. I admit I used to think it pretty damn swift to sport shoulder pads in my teeshirts, but I'm not still doing it. The collar turner-uppers can only do it because they believe it renders them more stylish. 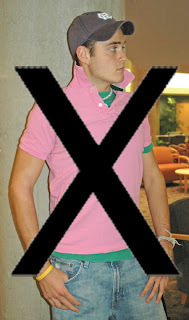 Yet if you cared about personal style, you wouldn't wear a polo shirt in the first place. I'm not the first to pose this question - it prompts much internet debate, a good deal of it insulting. But I've yet to read anything in defence of the habit from a committed collar-turner-upper. The internet also supplies plenty of images of silly young men striving to look preppy. The main offenders in my neck of the woods are femmes d'un certain age and sometimes their professional spouses. To me their up-turned collars are the perfect marker of a born-to-rule complacency that's quite out of touch with the world. Thank you for listening. I feel better now. The most famous turner-upper was Eric Cantona, of course. He had (still has) a wonderful sense of theatre, and for him I think it functioned as a portrait collar - turning a shirt identical to that worn by all the other players into a sort of personal theatrical costume. As far as I remember, he didn't do it with any clothing other than the football shirt worn while actually playing. And I don't remember that any other players or fans imitated it. Maybe they, too, perceived it as a dramatic act rather than a fashion. But on T-shirts he is always portrayed with this device.